Column: Springtime and all it brings - cleaning and activities! With Spring kicking into high gear and April now upon us, I wanted to take this opportunity to remind you that Green Bin pickup has now returned to its weekly scheduled pickup. Furthermore, it will no longer go back and forth between bi-weekly and weekly. With the changes made last year at Environment Committee, all Green Bins will now be picked up weekly, year-round with residual garbage collection moving to bi-weekly this November. Recycling collection in your blue and black box will remain the same. These changes have successfully led to $10M in savings that will be directly transferred to your garbage collection rate in 2013. For those of you who do not currently have a Green Bin, but are unfortunately paying anyway, you will receive a bin and collection as well beginning this November. For more information about the Green Bin and what can go in it, please visit www.ottawa.ca/greenbin. Every year, entire communities including schools, neighbourhood organizations and associations, businesses, families, friends and individuals take part in the Cleaning the Capital challenge. 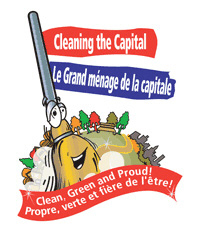 In 2011, more than 86,000 participated in Cleaning the Capital, a partnership of the City of Ottawa and Tim Hortons. It’s easy to take part. All you have to do is select a cleanup location where litter or graffiti has accumulated over the winter months. It can be a park, woodlot, ravine, shoreline, bus stop, pathway, schoolyard or any public property. Large or small, all cleanup projects are welcome. Projects may include litter pickup and/or graffiti removal. And don’t forget, cigarette butts are litter too. Once you have chosen your cleanup location, you can register online at ottawa.ca/clean or by calling 3-1-1 (TTY: 613-580-2401). The campaign runs from April 15 to May 15 with early bird registration starting on March 15. Register on or before April 14 for your chance to win early-bird prizes. Cleanup starter kits for litter pickup and/or graffiti removal projects are generously donated by campaign sponsors, and are available to all registered volunteers. All kits come with a helpful project and safety information to guide your cleanup project. Upon request and while quantities last, we will include magnets and stickers in the kits. Together we can help keep Ottawa clean, green, graffiti and litter-free. For more information and to register, visit ottawa.ca/clean or call 3-1-1 (TTY: 613-580-2401). And now a message from our friends at the Manotick Culture, Parks & Recreation Committee… On April 16, 7:30-9:00pm at the Knox Presbyterian Church in Manotick, the MCPRA is hosting a presentation titled “Manotick on the Move.” If you are interested in finding out how a village like Manotick might improve its "active transportation" amenities, come to this informative and engaging talk! Michael Haynes draws from his experience helping dozens of communities across the country become more pedestrian and bike-friendly. There will be a draft pedestrian map of Manotick Village posted and you can check whether your favourite trail or walking route is identified. Go ahead and share this with your walking or cycling buddies. For more information, visit the website at www.mcpra.com or call 613-220-2249. We hope to see you there! On April 21, the Goulbourn Historical Society wants to teach you a little more about this great village that many of you call home. Marion Scott, well known researcher and historian, and a long time resident of Richmond, will take you on a tour of Richmond, while you remain seated in a comfortable chair. This is an especially timely presentation - Canada celebrates the 200th Anniversary of the War of 1812, and Richmond was settled by demobbed soldiers from that war, who were granted land in the area. Local streets still bear names reflecting this historic past. This tour will teach you about the evolution of the village from its creation in 1818 to the turn of the 20th century. See how local pioneers and their descendants reacted to the changing economic conditions and transportation systems, and discover how this reaction is reflected in the architecture of the village. Paintings by Richmond artist Christy Pitcher, reflecting many of the older residences, will add to this presentation. The program begins at 1:30, at the Stittsville Library and as usual everything, including refreshments, is free. If you have any questions, comments, or concerns, do not hesitate to contact me at Scott.Moffatt@ottawa.ca or by phone at 613-580-2491.